30% of all the MEPs present for the vote did not approve the Provisional Agreement. This is a significant amount. The Commission lost its bid to confiscate your legal property and destroy your passion for sport shooting, hunting, collecting and other legitimate activities in which you use your firearms. It lost its crazed bid to destroy historical firearms in museums and private collections. It lost all this in spite of breaking its own rules, slandering innocent citizens, lying consistently and presenting false statistical data. The Commission lost because people like you came together to defend our common ideals and interests and supported us in every way possible in our efforts to gain the support of sensible MEPs. We reciprocated your support by carrying out all our work voluntarily in order to make the most of our limited resources. We are eternally grateful to you as we are to those MEPs who worked just as hard as we did to bring about this victory against all odds. Nevertheless Parliament ultimately failed you by not attempting to amend the text further in order to remove serious pitfalls that will come to haunt us in the future. It also failed you by not being bold enough to consign this legislative mess to the rubbish bin where it belongs. It failed you by choosing political exigency over your civil liberties. However the biggest loser in this entire process has been the EU itself and its credibility with millions of honest citizens like you who will neither forget nor forgive it for the way it has treated them. While we salute those MEPs who stood their ground, we should also bear in mind that many MEPs genuinely feared that were the Provisional Agreement not approved today, any change in its text would have resulted in a second reading in which the Council would have a greater say and Parliament a lesser one, possibly leading to a far more restrictive Directive. Thus we should refrain from accusing MEPs who did not vote for the amendments in the belief that this was for our own good. If anything, the circumstances illustrate all that is wrong in the EU’s structure and practices and how politicians are forced to make difficult decisions because of its unduly complex and undemocratic legislative process. They are as much victims of the system as the citizens who are forced to abide by its rulings. The war is far from over. The battle to ensure that our member state authorities implement the Directive in the least restrictive way starts now. We shall also consider all legal means of challenging the revised Directive at EU and national levels. This conference is becoming very interesting at 20:00 when Dita CHARANZOVÁ (ALDE, CZ) quarrels with Vicky FORD (ECR, UK) and Anna Maria CORAZZA BILDT (EPP, SE). Again Dita critisized the missing impact assessment, the missing answers of the Commission to the public 30.000 feedbacks and logical pitfalls. Journalists were able to make questions at 26:00. I enjoyed Dita speaking the truth and standing up for us. Other than that this press conference was UNBEARABLE! First I thought I’d throw up over Vicky Ford defending the directive because it is „the exact situation right now“. Oh yes great! The directive didn’t fix anything and that’s a great thing? Now I understand how the EU works! Also saying that national exemptions are possible so it’s not bad that the directive outright bans normal magazines. Why the hell ban something if you want (pretend) to except everyone from it? But I get side tracked. What I wanted to say was: First I thought Vicky was bad but then the German and French „journalists“ asked their uneducated questions. Holy cow! I really think it’s a very very bad thing that Germany is by far the most powerful country in the EU and that France is it’s pet country. Everything about this directive from the first draft, the commissions disregard of their own rules, ignorance and fake information (propaganda) showed me how broken the EU is and I really lost all faith in it. All we can do now is fight for our rights with all our might and money and try to stay on top until this perverted bureaucracy monster crumbles under it’s own corruption or gets a complete overhaul. I was a great friend of the European project but I completely lost all faith in it after this experience. If this is what is left of the European idea we better come up with something better. 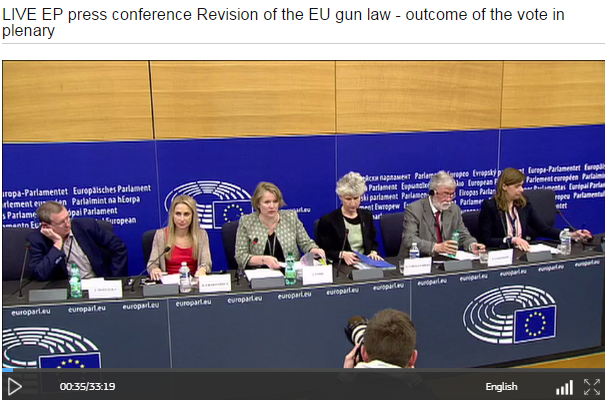 I REALLY want to thank everyone at Firearms United and all the MEPs that listened to us and fought alongside with us. You did a great job and I salute you for not going insane while dealing with THIS and the many crazy fundamentalists involved.